Free Shipping Included! Jetsettermaps Scratch Your Travels United States of America (USA US) Watercolor Art Map 12x18in Poster by JetsetterMaps at HoldUp Art. MPN: JS-1-1-USA. Hurry! Limited time offer. Offer valid only while supplies last. Scratch Your Travels with JetsetterMaps! Use a coin to remove the gold foil over states you've visited to reveal an original watercolor painting! Scratch Your Travels with JetsetterMaps! Use a coin to remove the gold foil over states you've visited to reveal an original watercolor painting! Fits any 18x12 in frame. Comes packaged in a sleek contemporary tube for easy gifting or storing. Makes a great gift for people who love to travel! Framable Art: Fits any 12 x 18 in frame perfectly. *Please note this listing does not include the frame. Original Artwork: Bright, bold & vibrant watercolors by an American artist. Proudly designed in the USA. 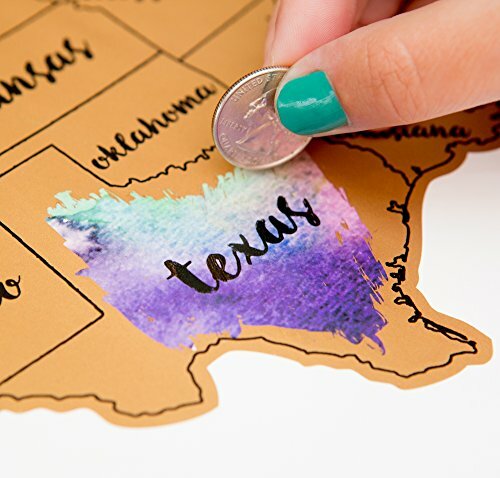 Scratch Your Travels: Use a coin to remove the gold foil over states you've visited to reveal an original watercolor painting! Attractive unisex packaging: Comes packaged in a sleek contemporary tube for easy gifting or storing. Unisex and great for all ages! *Packaging may vary. If you have any questions about this product by JetsetterMaps, contact us by completing and submitting the form below. If you are looking for a specif part number, please include it with your message.